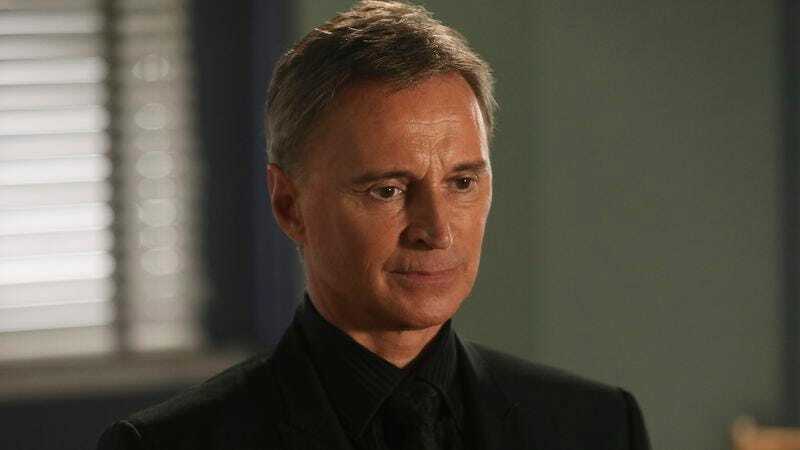 Robert Carlyle is so good, when an episode like this one is focused on him, every scene he’s not in just seems at best a distraction, at worst a waste. With sparkly skin, without, he commands every scene he’s in, and is somehow able to sell this fairy-tale malarkey. His bizarre but impassioned explanation to an imprisoned Belle actually managed to garner some sympathy for the Darkest One of all. In lesser hands (Snow and Charming), these complicated mythologies fall apart like soggy parchment paper. That Black Fairy plot twist was unexpected even as it made a lot of sense. Well done, show. Any chance that was Emilie De Ravin’s real baby? He was awfully cute, and rather small for TV baby size. Kind of glad Gideon has fled, because this show already has enough babies that it often forgets about (poor Neal). The costume designer on this show has gone as nuts as the hairstylist. The Evil Queen is a Rocky Horror reject, Regina has swiped Sgt. Pepper’s jacket, and Zelena looks like a Muppet. The Blue Fairy resembles something you could pop on top of an extra toilet paper roll. And what in the hell has Emma been wearing lately? I never thought I could be nostalgic for a red leather jacket. Worst of all, she’s wearing that Tyrolean blanket shirt again next week! Hey, Snow and Jasmine remembered that they’re teachers. “I hear fairies make wonderful mothers.” Burn. Whatever, Savior. And Aladdin’s a genie now?